The St Nicholas' Tour enables website visitors to browse through the various sights that St Nicholas' has to offer from in and around the Centre itself to the beautiful grounds and award winning gardens. 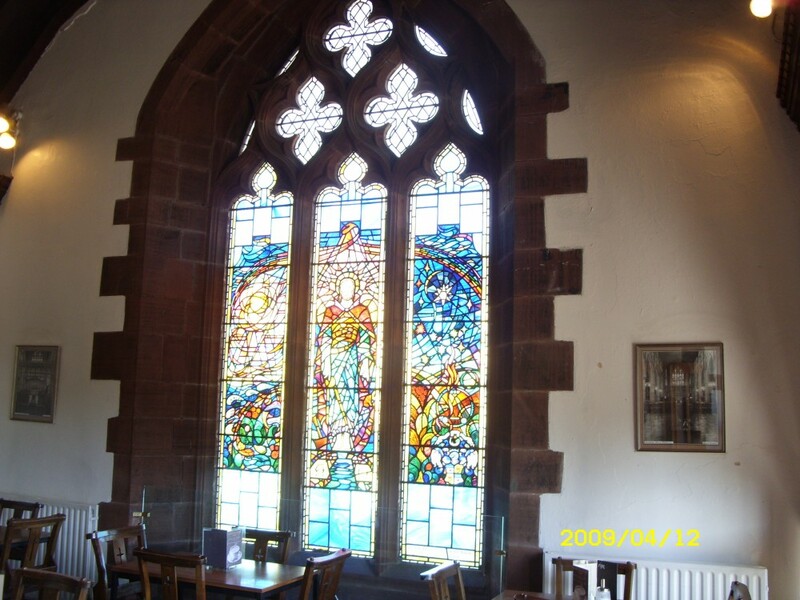 I hope you find the tour interesting and informative, although this is just a peek at what the St Nicholas Centre has to offer, so why not pay us a visit to see the St Nicholas Centre and the wonderful surroundings of Whitehaven for yourself! 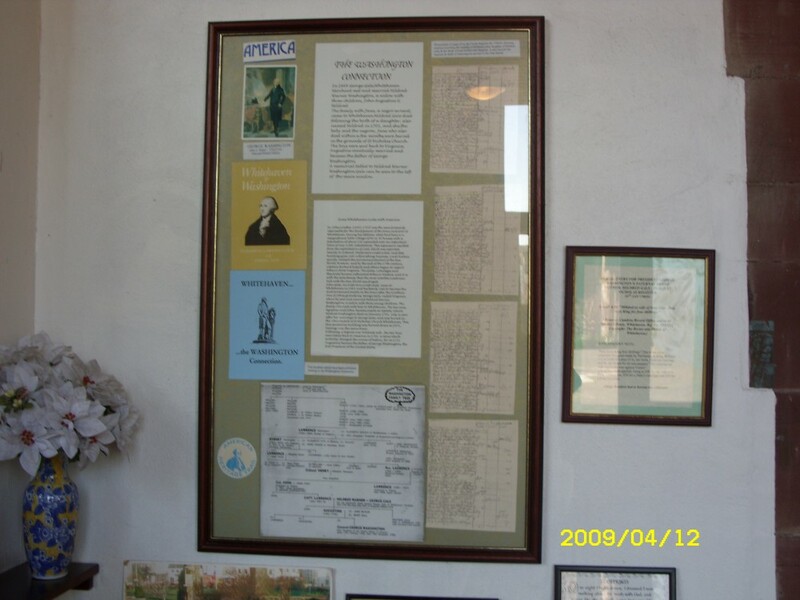 The Exhibition Room in the Clock Tower is only open by prior arrangement with the Parish Office. 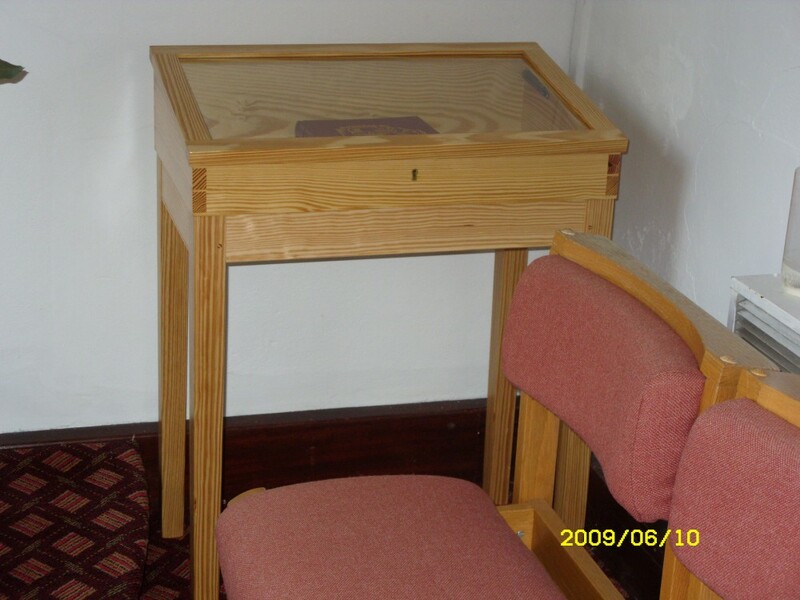 There are various exhibits there including the oldest font in the area. The Churchyard-The area around the Church was laid out in an ornamental design with a small section at the East end reserved as a Burial Ground. This was subsequently enlarged in later years. A row of shops and houses were built against the wall that went along the East (Duke Street) end, but when they were demolished, the tombstones that had been fixed to this wall, were all laid flat on the ground. Some of the broken ones were stood on end to form raised beds in which shrubs and seasonal flowers are grown. Four graves are left in situ- these are for the Thompson family- William (fron Whitehaven) was the 86th Archbishop of York from 1863 to 1890. There is more information about him and this important Whitehaven family in the Tower Exhibition Room. See separate page on this guided tour. Connections with America- Probably the best known of these is the raid on the town by John Paul Jones. 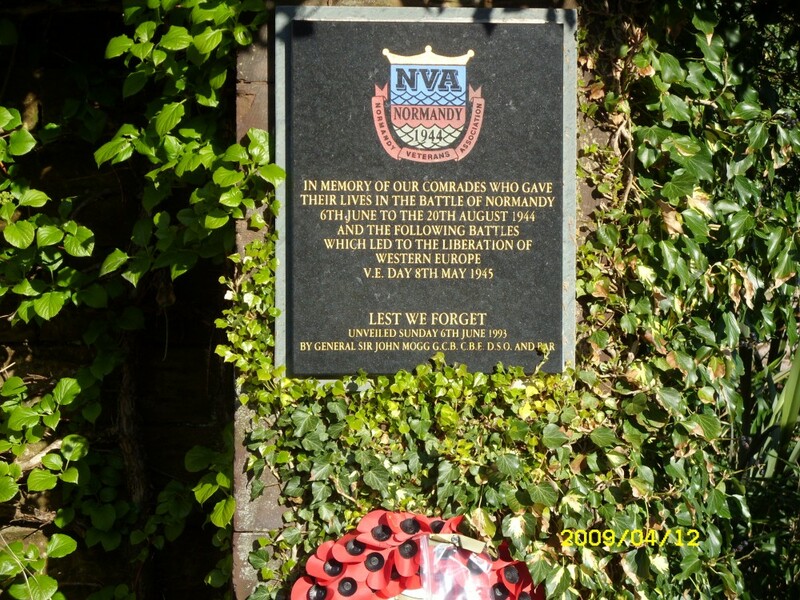 A mosaic in upper King Street, near the Duke Street junction commemorates this event. 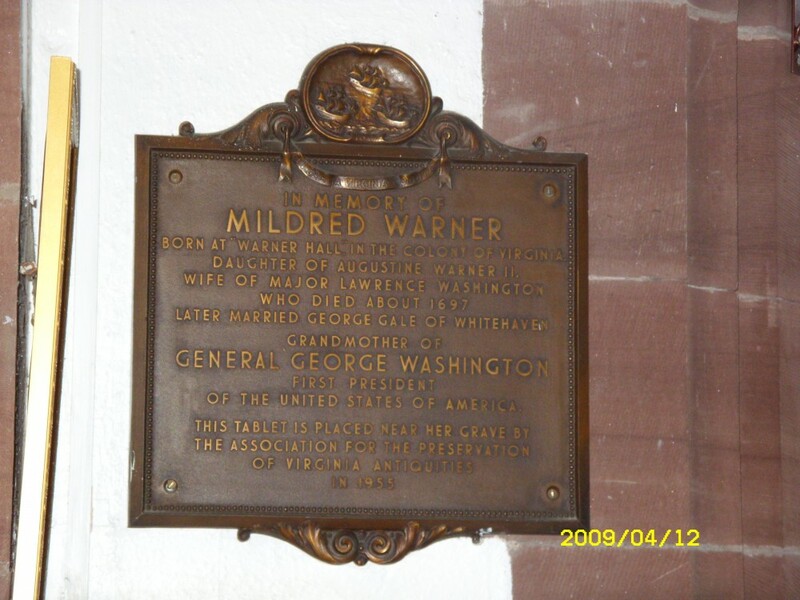 However, the Washington Memorial plaque is housed in St Nicholas Centre. 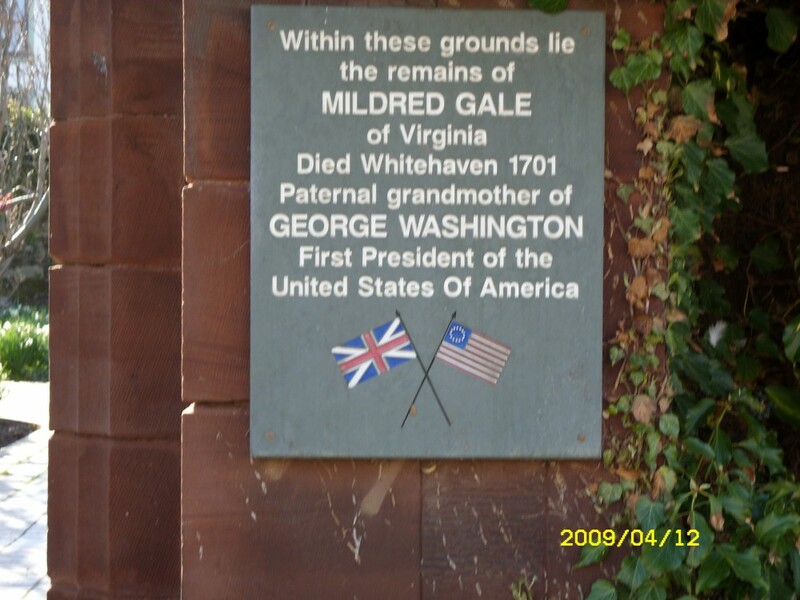 This is dedicated to Mildred Gale whose grandson was the American President, George Washington. The grounds around the Church were laid out like a garden, and even today they are considered to be one of the best in the Carlisle Diocese. 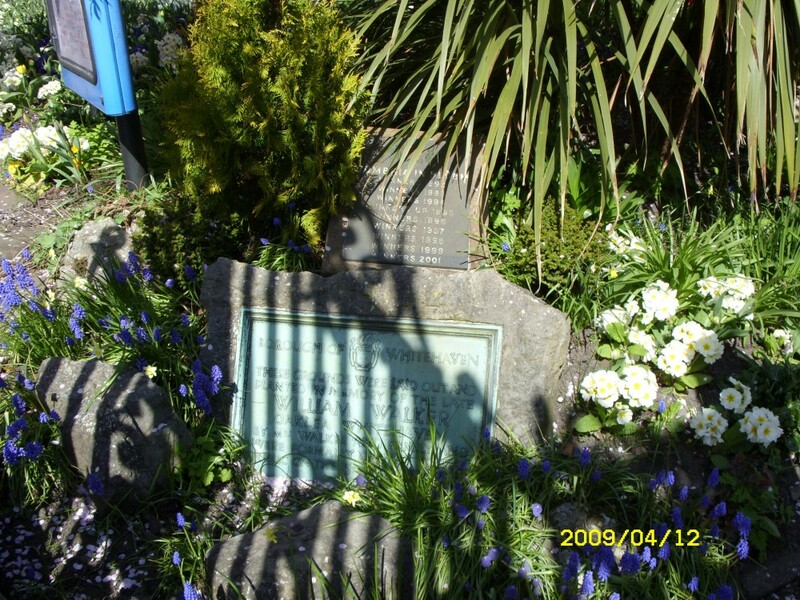 A plaque in the grounds shows how many times Whitehaven has won the annual Cumbria in Bloom contest in which the floral displays play a significant role. See separate page on this guided tour for more about William Walker whose gift enabled the creation of the gardens, and their 1920 openig. 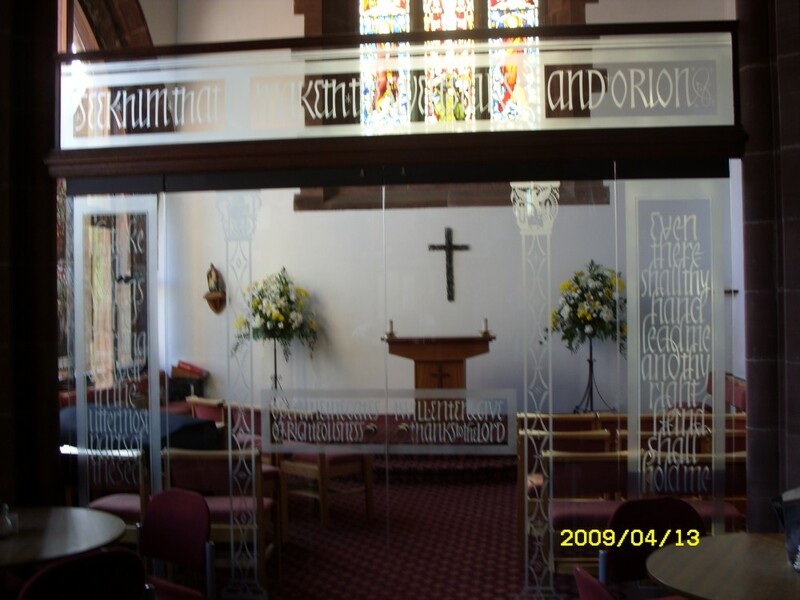 The Chapel- This is separated from the refreshment area by an engraved glass screen, which opens up if so required, so that the total floor area can be used for larger gatherings than the Chapel itself can accommodate. 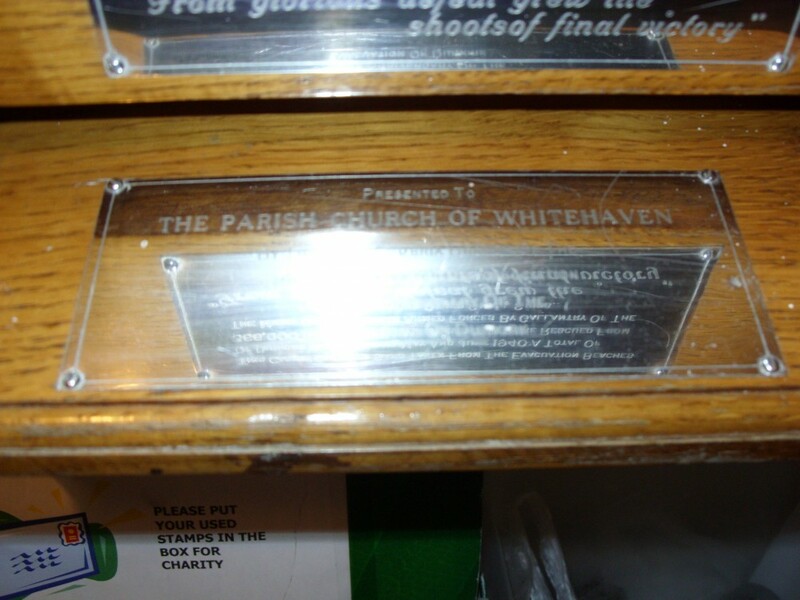 The engravings on this screen are designs which symbolise other churches in Whitehaven, namely Christ Church and Holy Trinity Church. (neither of these now exist as places of worship) and the Pilgrim shell for St James' Church. The window that looks out on to the former Nave is set out in panels. The centre one is a beautiful illustration of the hands of God reaching out towards you in the act "of creating the stars". Both the screen and the window have the same common theme ---the power of God and the Creation. The history of Whitehaven as a mining community and a seaport are reflected in the text chosen for the side panels of the screen." 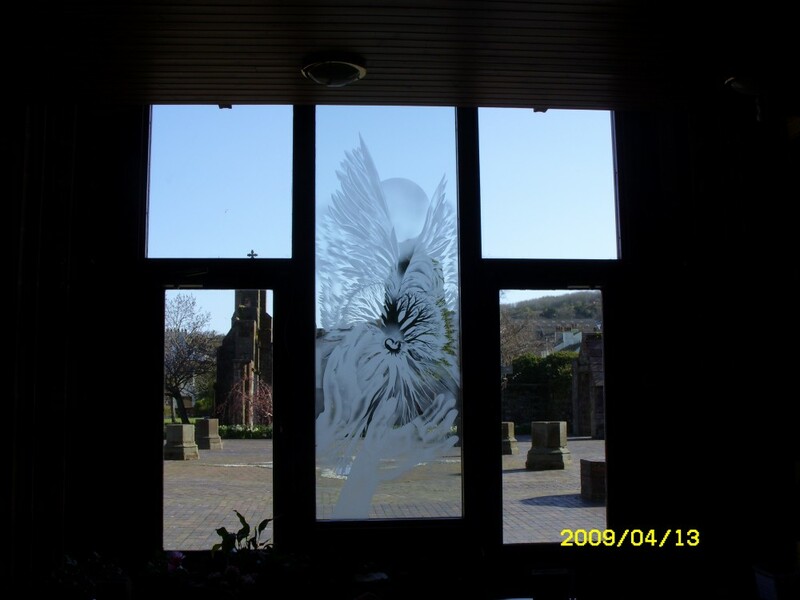 If I take the wings of the morning" comes from Psalm 139, and these wings are re-created in the window designed by Sally Scott. The two former churches of Whitehaven are represented as two columns, of shafts, and bases, surmounted by capitals. Christ Church is portrayed by the Sacrament, the Crook of the Good Shepherd, an anchor, and the ancient symbols of the Shi-rho and the Alpha and Omega. A pilgrim's shell for St James completes the design. The symbols for Holy Trinity are given a different portrayal on this capital. Instead of the hand of God the Father reaching from the clouds towards a crucifix and a dove descends, the hands are below, supporting Christ, crowned and reigning, and releasing the dove of the Holy Spirit, here with an olive branch. Pentecostal flames and a candle complete the design, with the spaces filled with the seven stars and Orion. The Glass design was by David Peace MBE of Hemingford Abbots and Sally Scott of Twickenham. 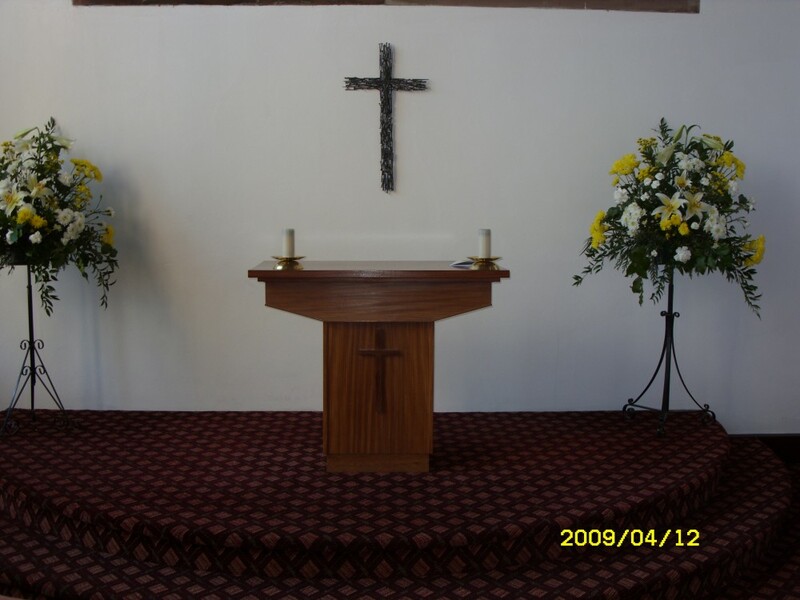 The Altar, made by Mr Ian Robertson in memory of his parents, utilised wood from the original Altar. 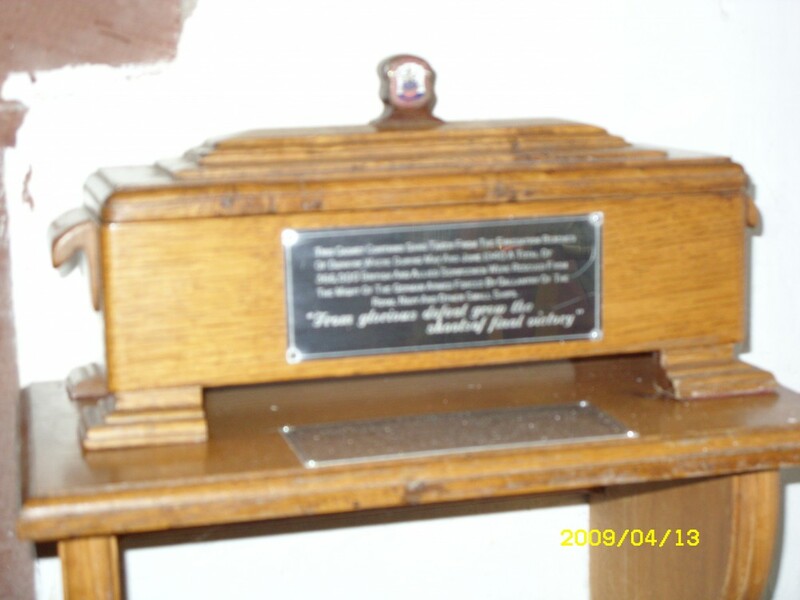 To the right of this is the carved figure of St Nicholas which was saved from the 1971 fire. The Engraved Window- Though the screen and engraved window are separate; they both have the same theme. That of the Power of God and the Creation. Spanning the screen and the window are the words of the prophet Amos -- "Seek him that made the Seven Stars and Orion". In the tall window the hands of God reaching towards you are creating the stars ,with Orion in his right hand and Pleiades in his left. 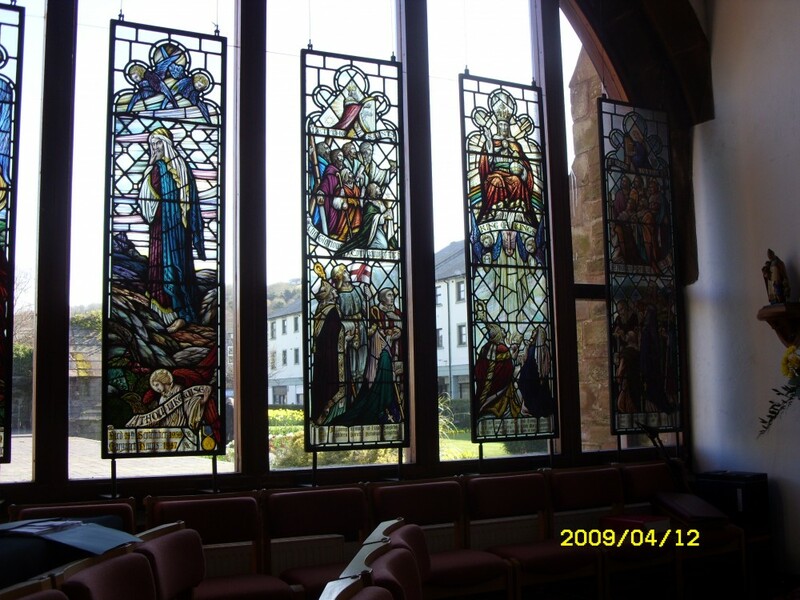 The window is also inspired by the story from the book of Exodus of Moses and the burning bush. 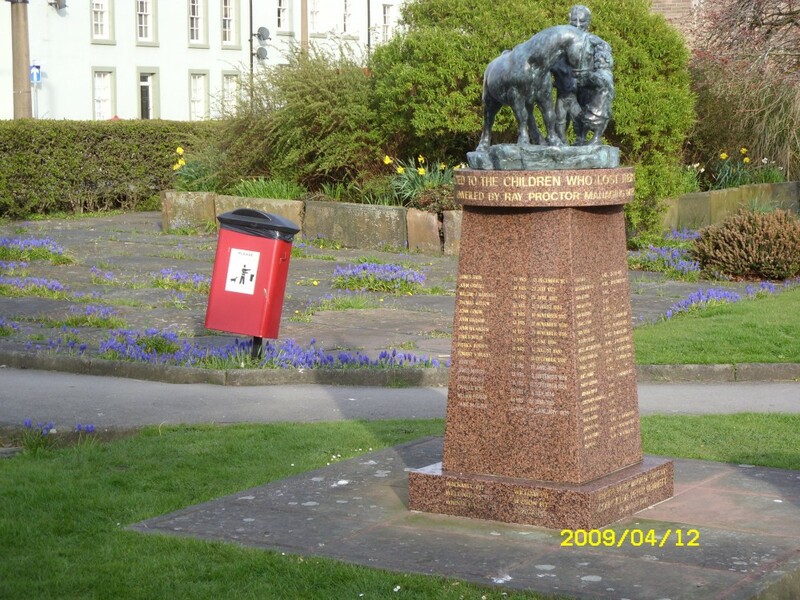 The Memorials- In a town that owed much of it's development to the coal mining industry, it is fitting that there should be a lasting tribute to the workers who lost their lives in the pits. 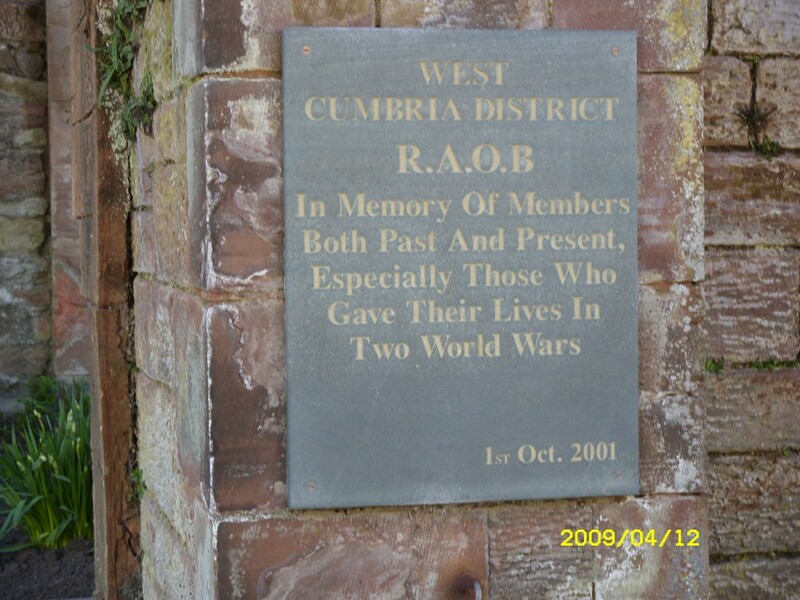 There are two such memorials in St Nicholas grounds and one in the Chapel. 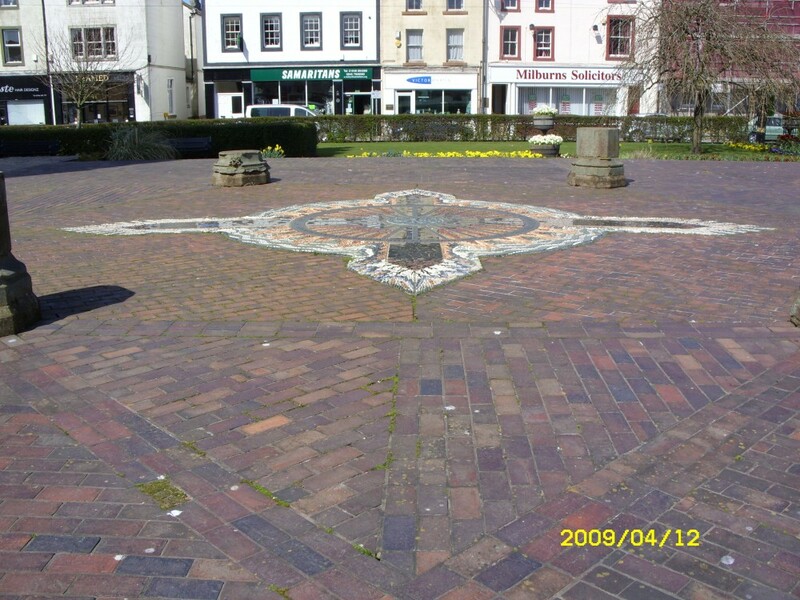 The one that is near the entrance from Duke Street, is in the form of a sundial, and is inscribed with the names of the children who died while working underground. A book by a local ex miner and historian Ray Devlin called "The Children of the Pits" gives a very graphic account of working conditions at that time. 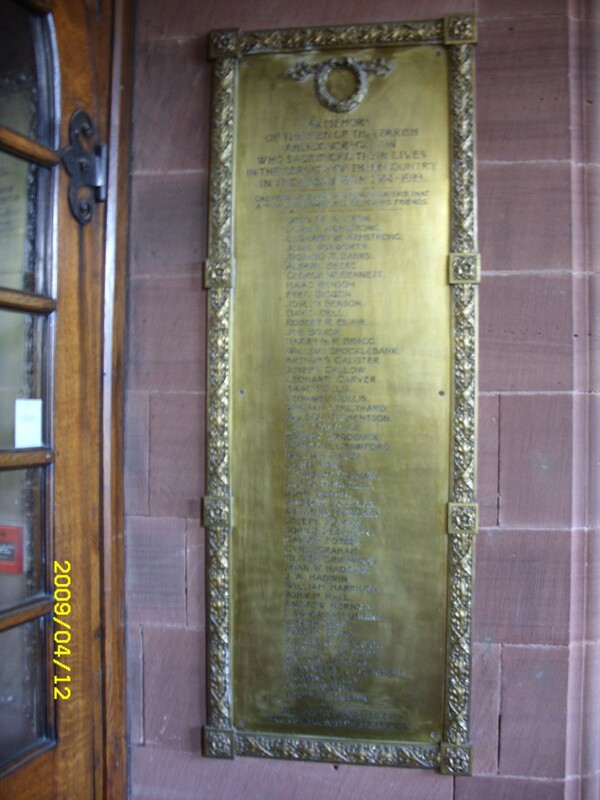 The second memorial is on the former Nave area and measures 8 metres at it's widest point. This is a mosaic of a pit wheel, each part illustrating a connection with mining. The spokes of the wheel bear the names of pits that have operated in the Whitehaven district from 1597 until the last one closed in 1986. Around the wheel red and yellow stones represent heat and power, while green slate strips form the sea. White limestone and quartz pebbles represent the fact that most of the pit workings were under the sea. 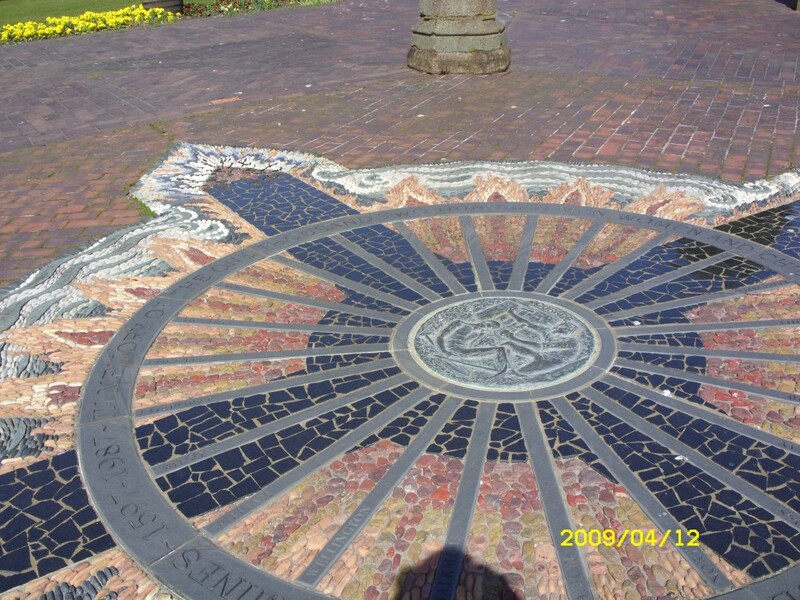 The centre of the mosaic shows the Edward Medal, (the miners V.C.) which is awarded in cases of extreme bravery, to rescuers who risk their own lives to recover both the living and the dead in the aftermath of a pit accident. 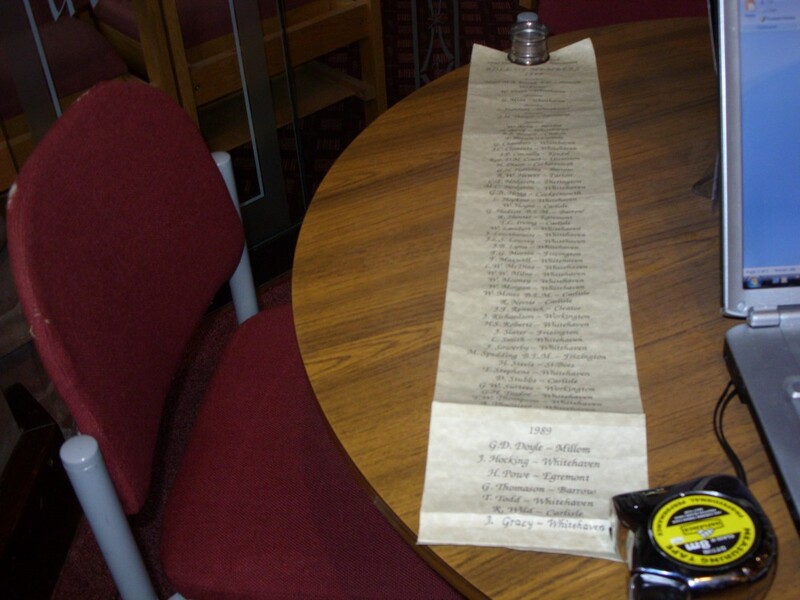 Also in the Chapel there is a book of remembrance to all those people who lost their lives locally in the Coal Industry. A database of the names is available on the link below. Individual pages can be viewed BY PRIOR ARRANGEMENT. 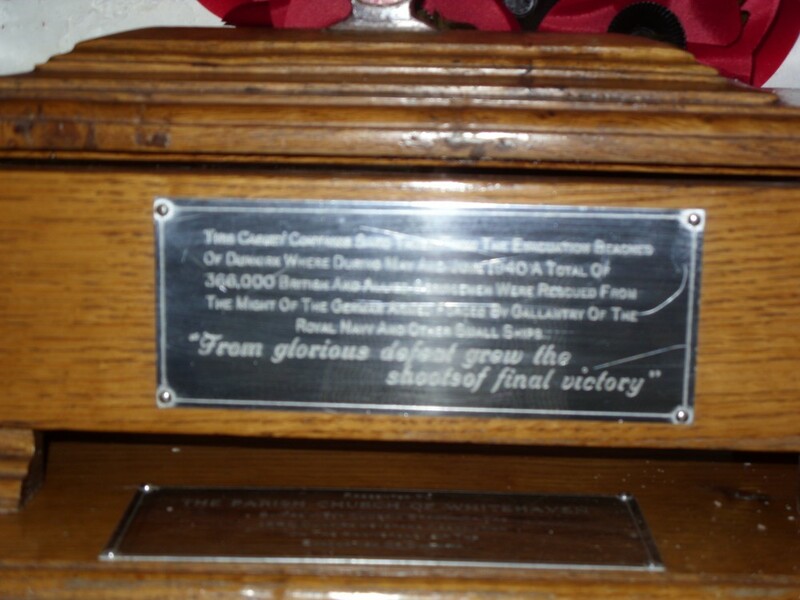 There are also WW1 and WW2 memorials inside the cafe area, a Normandy Veterans Association Brass Plaque in the Chapel and a Dunkirk Veterans Casket in the Cafe Area. This is the work of Heaton, Butler and Bayne (designed by Bayne). The subject is ‘The Crucifixion’. Lower: (1) He was wounded for our transgressions (2) He was bruised for our iniquities (3) ? It is said to have been installed in the Old Church as the East Window shortly before it was demolished in 1881, but has always been in this location in the new Church (opened 1883). Joseph Henry Robinson of 83 Lowther Street was buried on 29th April 1878 aged 69 in grave 4G94 at Preston Quarter Cemetery. In 1847 they were living at 19 Hilton Terrace and at the 1851 census the family were at 24 Roper Street, and he was an agent for Thomas & John Brocklebank (Ship Building and Timber Yard). In 1861 he was an Iron Ore Proprietor’s Assistant. By 1871 he was an Iron Ore Proprietor (born Sowerby, Cumberland). He had married his wife Jane Blake (nee Hilton and born in 1822 in Whitehaven, baptised at St. Nicholas on 28th January 1822) in the June quarter of 1846. They had children Hilton, Maud, Maria & Joseph Henry. He left about £35,000. 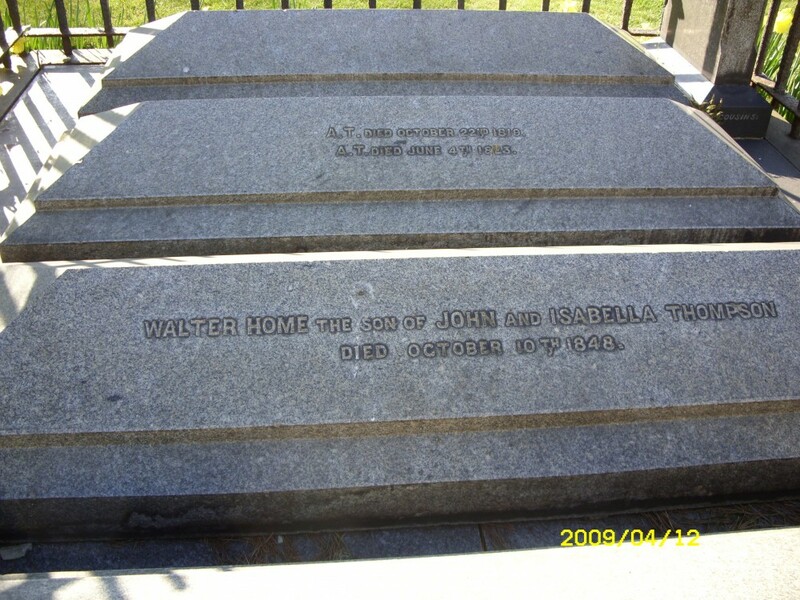 His wife died on 7th February 1906 (funeral on 10th February). Hilton died in 1858, aged 11. This was originally installed in the baptistery, it was saved from the fire of 1971 and installed in this location when the church was restored to its current format in 1986. Inscription: Top: THIS IS MY BELOVED SON Bottom RHS: In loving memory of John Barr,/Churchwarden of St. Nicholas for/25 Years. Died 26th March 1916, aged/80 years; and his wife Mary Ann,/died 5th January 1905 aged 65 Years./Erected by their Daughters. 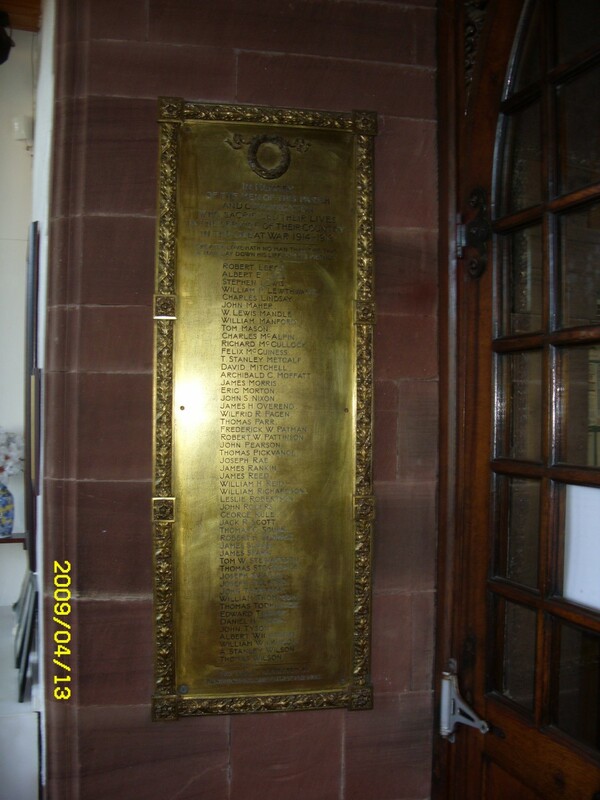 [Mary Ann was buried on 9th January 1905, died 5th January, from 96 Duke Street, in Grave 1T55 at Preston Quarter Cemetery, and John from the same address in the same grave on 31st March 1916, died 26th March]. John Barr was born on 7th December 1835, and his wife (nee Adamson) on 30th January 1839. The marriage was at St. James Church on 9th September 1867. Sarah Florence 31st January 1881 to 14th February 1958, baptized at St. Nicholas on 16th March 1881. Emily Jane Barr 25th May 1873 to 20th April 1953, baptized at St. Nicholas on 18th June 1873. She married a John Rowatt Haddow (a Jeweller from Paisley) at St. James on 18th September 1906. 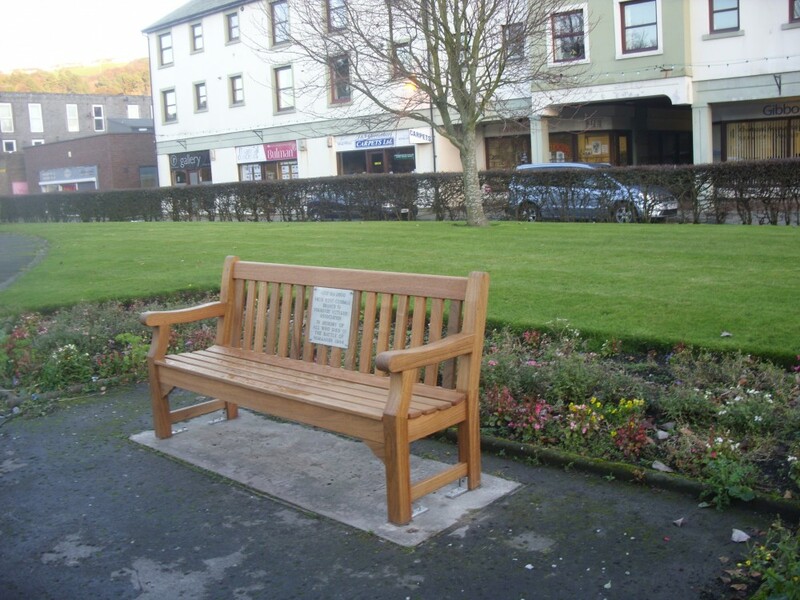 He died at 3 Marchbank Terrace, Dumfries on 29th December 1932 (buried at Dumfries Cemetery), and she died at 27 Earls Road on 20th April 1953, and was buried in Grave 1T53 at Preston Quarter Cemetery on 24th April 1953. 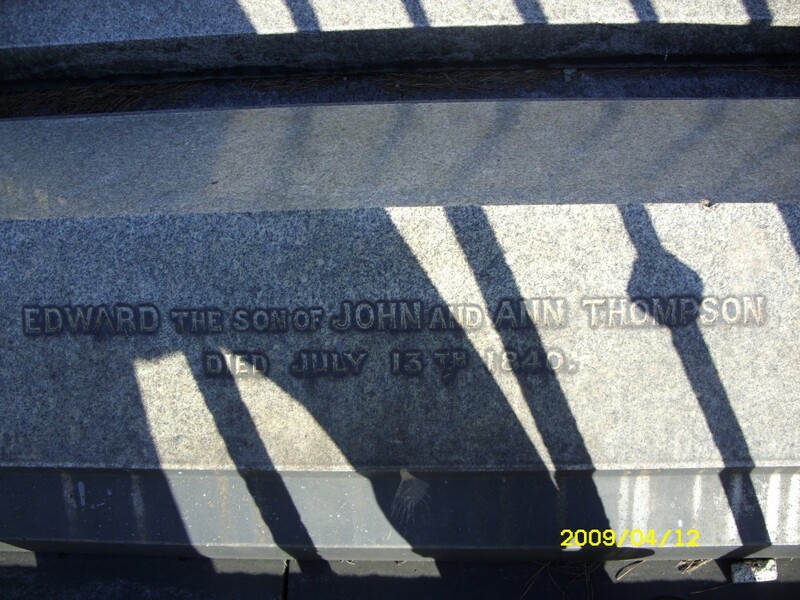 John Adamson Barr 25th March 1870 to 23rd September 1939, baptized at St. Nicholas on 17th April 1870. He was buried at Hensingham Cemetery on 27th September 1939-there is no gravestone, but he is commemorated on gravestone 1T53/1T55 at Preston Quarter Cemetery. William Sibson Barr 31st January 1875 to 10th Movember 1953, baptized at St. Nicholas on 5th March 1875. He became a Commercial Traveller, and married Mary Ann Crone at Christ Church on 13th September 1899, when he was living at Huddersfield. In the 1901 census they are shown as living at Sneckyeat, Hensingham. He died in the December quarter of 1953 in the Whitehaven area, but is not buried at either Hensingham or Whitehaven/Preston Quarter cemeteries, but is commemorated on gravestone 1T53/1T55 at Preston Quarter Cemetery. Thus they had a total of seven children. 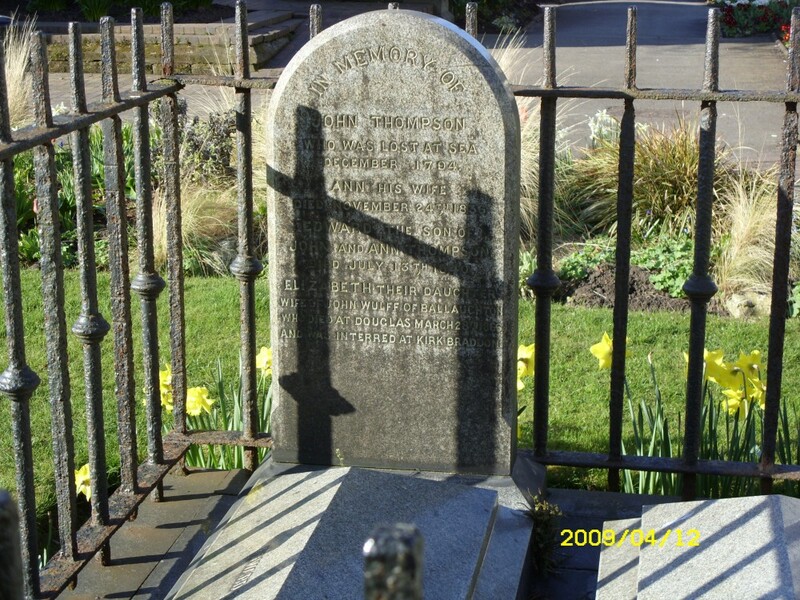 The gravestone also commemorates the sister of Mary Ann Adamson/Barr, Sarah, 10th May 1845 to 22nd September 1937. 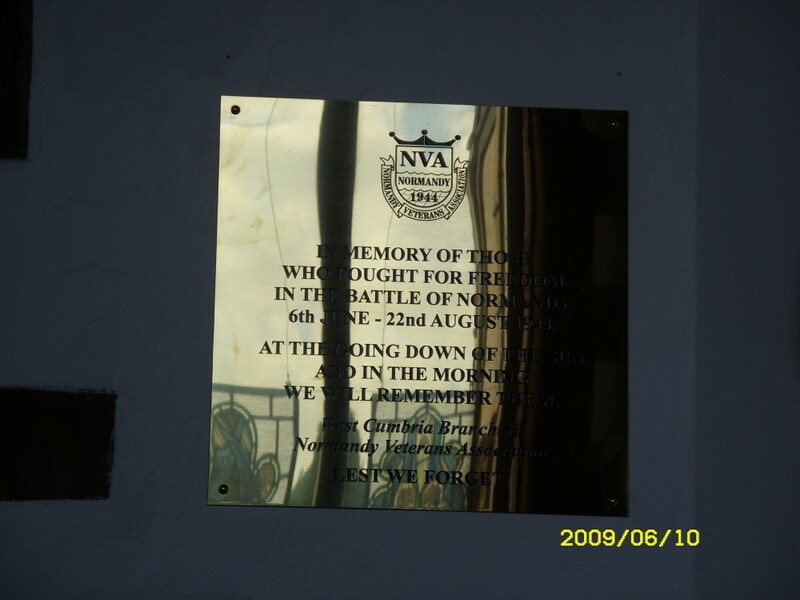 (It will be noted that the window was installed many years after the death of those who are commemorated). He was one of the oldest, best known and most highly respected of Whitehaven tradesmen but who had been in delicate health after a stroke 2 years before his death. In the early 1860’s he was the Foreman for Mr. Davis in his shop at the corner of Tangier St and Duke St which was open until midnight. 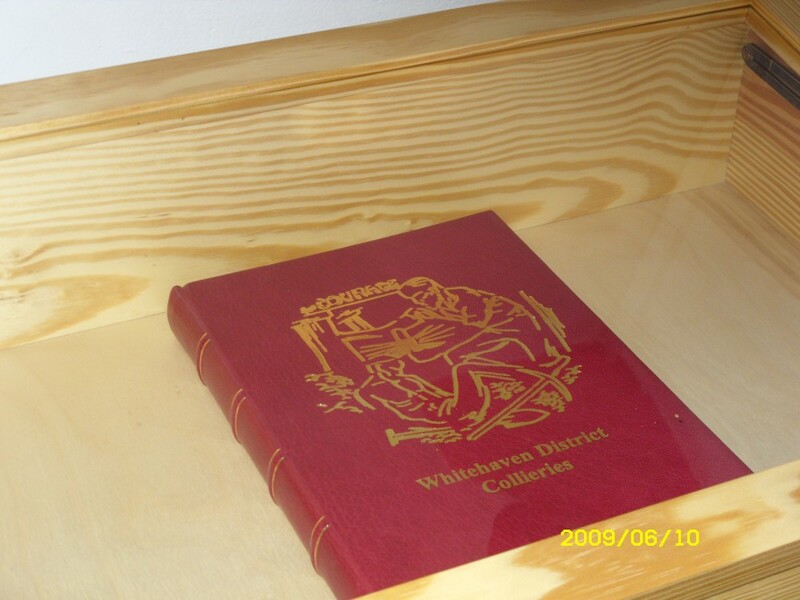 In business he then set up on his own account (by the time of the 1871 census) as a family grocer in Lowther Street. The family home was 96 Duke Street, at the corner with Church Street next to the auction mart. At his death he had a grown up family of four sons and two daughters, and left £12,990. First and foremost he was a freemason. He was Initiated into Lodge 119 (Sun Square and compasses) on 2nd September 1861, the worshipful master in 1866, and the Provincial Grand Steward in 1867 (the centenary year of the lodge). He progressed through almost every possible position in both the lodge and the Province. In 1875 he was admitted to the degree of Mark Masonry of the Red Cross of Constantine. In 1905 the lodge presented him with his portrait by Brother J Smith of Drigg. He was also a Rifle volunteer, believed to be one of the founders in December 1859, finishing as the Colour Sergeant, basically the highest possible position. Although a Conservative he never went for public positions, and was only briefly a councilor. His funeral at St. Nicholas was at 2.30 pm on 31st March 1916. 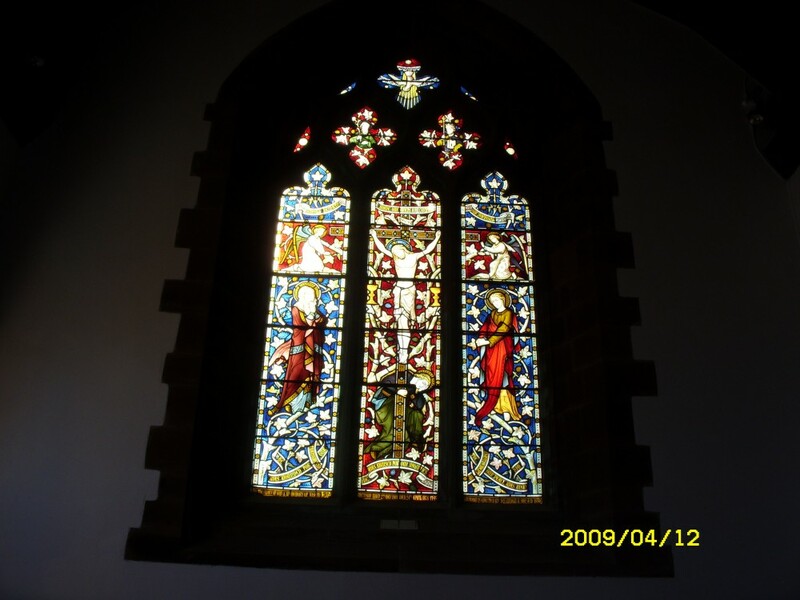 These were originally installed in the South Aisle in 1947 as one window. 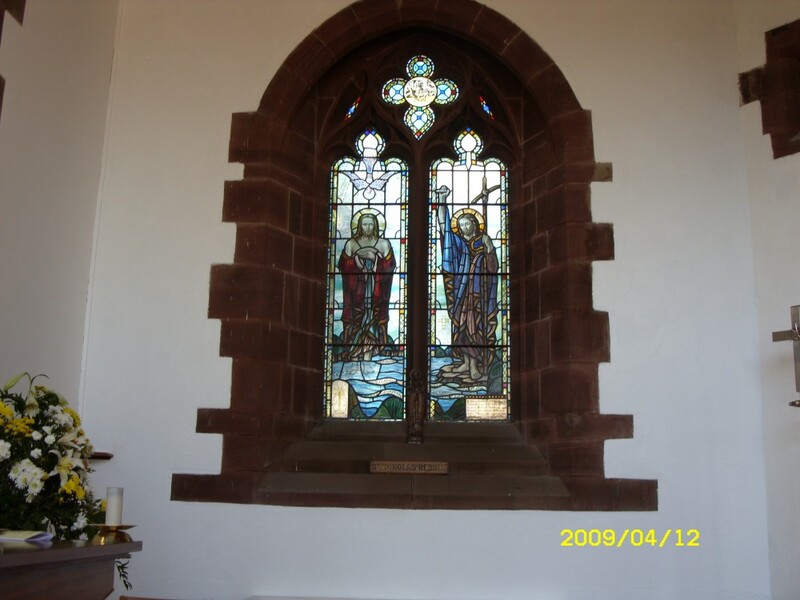 It was saved from the fire of 1971, but there was nowhere suitable to reinstate as a complete window so was installed as two panels in this location when the church was restored to its current format in 1986. Panel 2: First at bottom: THOU LIKEWISE Very bottom: Died 24th September 1939/Margaret harris 1947. (These panels are not quite the complete window as can be seen from the missing words). He undertook National Service in the Great War, with the Border Regiment and rose to the rank of Major. He was involved in the Boy Scouts for over 25 yrs and was both District Commissioner and County Commissioner. In the 1910 disaster he went down Wellington Pit to assist, and was awarded the Edward medal in recognition of his work. He did the same in several other pit disasters and accidents. He was also involved in the St John Ambulance where he was an instructor, lecturer and examiner. He was a Councilor for Trinity Ward from 1923 to 1939. He was also the President of the town British Legion, and a freemason for over 60 years in the Sun, Square & compasses Lodge Number 119. He was accorded full Military Honours for his funeral on 27th September 1939, and the way from his home at Moresby Hall to Moresby St. Bridgets Church was lined by scouts. The Military band played Chopin’s “marche funebre”. He was 75 at the date of death. He was survived by his wife Margaret Jane (who he had married at Wandsworth in the September quarter of 1898) and one son, Victor. Margaret (known as Jeanie) died (at 8 Eden Mount, Carlisle) on 7th June 1952 and was buried in the same grave on 11th June 1952. He also had a home at 14 Scotch Street. These were originally installed in the South Aisle in 1948 as one window. 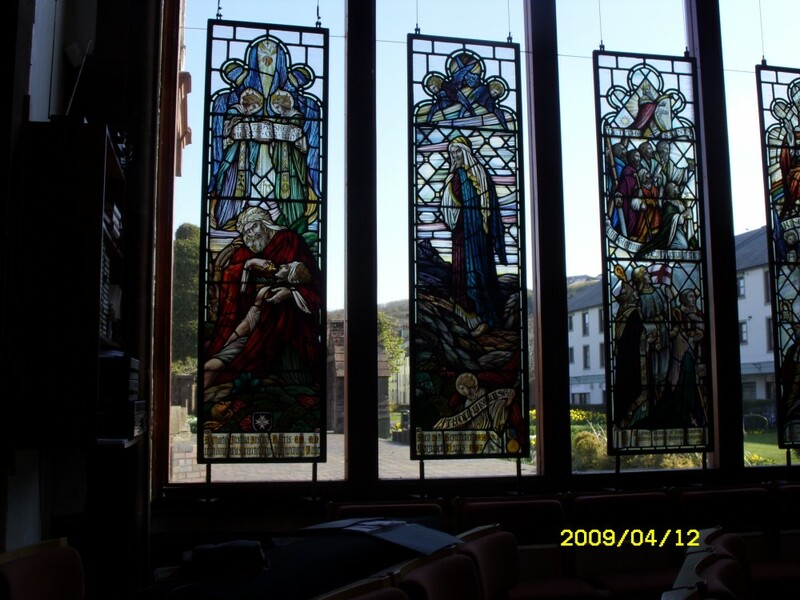 It was saved from the fire of 1971, but there was nowhere suitable to reinstate as a complete window so was installed as three panels in this location when the church was restored to its current format in 1986. Panels 4 and 5 should be in reverse sequence, hence why the inscriptions appear to make little sense. 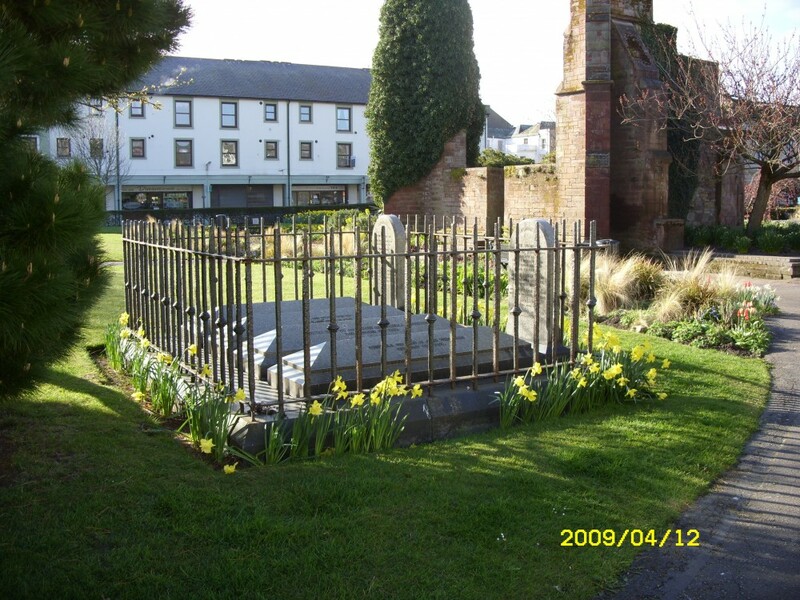 Isaac Singleton died at Moor Row on 16th June 1884 aged 37, buried on 20th June 1884 by the Curate of Egremont in Grave 1R160 at Preston Quarter Cemetey. His wife Fanny Singleton died on 28th July 1939 aged 80, buried on 31st July 1939 in Grave 1R160. Edith Mary Singleton (Spinster) died 2nd April 1918 aged 35,buried 6th April 1918 in Grave 1R160. Dorothy L. Singleton (Spinster) died 14th August 1947 at Cumberland Infirmary, Carlisle aged 73, buried 16th August 1947 in Grave 1R162 at Preston Quarter Cemetery. Light 1: In loving memory of/THOMAS STANLEY DURHAM 1889-1961 Light 3: Sometime Churchwarden of this Parish. Erected by his Widow. 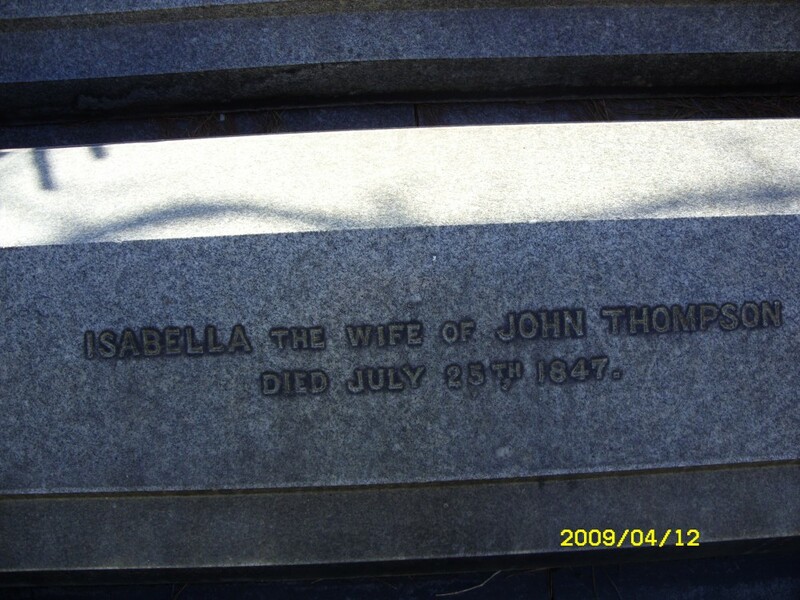 He was the oldest child of Joseph and Sarah and had siblings-Sarah Annie, Joseph M, Richard S, Mabel and William. They lived at 9 Mill Street in 1901. He married Sarah Elizabeth Steele of Middletown on 1st August 1917 and died on September 3rd 1961 at “Broom”, Gosforthat which time he was a mining engineer. 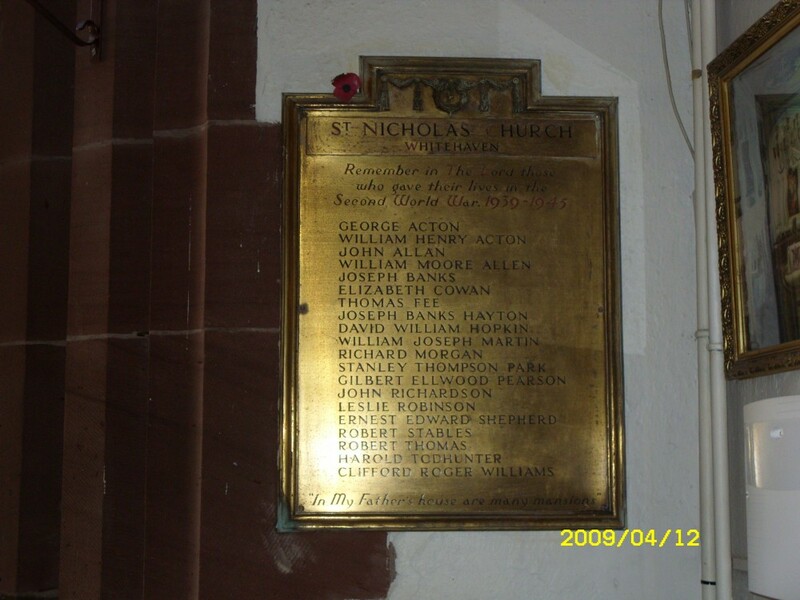 He was Churchwarden of St Nicholas' from 1928-1929. “They chose Stephen, a man of faith and of the Holy Ghost” ACTS VI Verse 5. Note this window is largely obscured by the mezzanine floor and the downstairs toilets.